Passenger vs. Driver: Are You Driving Your Creative Journey? If you’re anything like me, you might not be driving your creative journey the way you think. Autumn, with its chilly temperatures and shorter hours of daylight, is settling in. I feel like I don’t have the same spring in my step, that sometimes I need a little more of a nudge to get me to my desk and write. The changing of the seasons, and what often feels like a sprint towards winter, is a time when I often find myself thinking about my life — where I’ve been, where I am, where I hope to be. And with the release earlier this month of my last novel, Everything He Thought He Knew, I’ve been asking myself this: Am I a passenger or the driver on my creative journey? My first contact with the arts came through music. I started piano lessons when I was six, and it wasn’t long before I was performing in church and in the spotlight. I was a timid, even awkward, young boy who didn’t want the attention. Despite my love of the piano, I turned away from music in my twenties. Looking back, it was a way of affirming who I was. Maybe my parents saw it as an ‘act of rebellion,’ but I had other ideas about my life. I didn’t want to be a church organist, and by then I’d lost any interest in a professional music career. Perhaps, too, I was scared that I didn’t have the necessary talent to succeed in the music industry. Or that I had bought into the belief that a life in music, and the arts in general, was a dead end that would only lead to alcoholism and drug addictions. Did I really want to end up like that? My mother prayed that I wouldn’t! I went off to university, crisscrossing the country and the Atlantic Ocean, trying to figure out what exactly it was that I wanted to do with my life. By the time I finished my undergraduate degree in French literature in 1997, I wanted to be a writer. I began writing daily, filling notebook after notebook with stories, poems and tangents about the world I never dared to share. Eventually, some of my short stories, poems and essays were published. And then, after a lot of hard work and weathering the flood of rejection letters, my first novel was published. Writing began to bear fruit. Or so I thought. As I pursued my writing — and certain that I was doing what I love — something was missing. I couldn’t pinpoint what that something missing was. Writing prompted me to pick up a paintbrush after a long time away from the easel. Still, despite expressing my creativity through words and painting, something still felt off. When I moved to Ottawa in 1999, it was the first time in my life that I didn’t have regular access to a piano. The only time my fingers touched the keys was when I returned to Halifax to visit family, which wasn’t that often. There it was, the something missing from my life. Music. Despite having ‘turned my back’ on it, music kept calling to me. A week after I’d started a new job in 2004, one of my colleagues mentioned that the person whose position I had taken was looking to sell her baby grand piano to make room for the incoming grand. Without batting an eyelash, I bought the piano. I was making music again. From 2005 to 2013, I bounced creatively between music, painting and writing. Some days I ended up completely lost in my writing, and that was all that I could do. Other creative projects ground to a halt. There were also days when I spent the early morning writing, then a few hours in my painting studio after lunch, and then sit down at the piano not just to practice but to compose. And the music rained down on me in torrents, and I struggled to take it all down — to let ‘God’ or the ‘Universe’ work through me in a new way. There have been many twists and turns along my creative journey, and I realized that I had been a passenger more than the driver. At that time, I didn’t mind being the passenger because the adventure was, in part, not knowing where I’d end up. But I realized that as I explored the different facets of my creativity, I wasn’t moving forward, wasn’t making progress. The thrill for me, what got my mojo working, was creating all these different projects (through music, words or painting), and then just putting them out in the world and walking away from them. I’d sit back and hope the world would take notice. No wonder I was always disappointed. Since 2013, I’ve been focused singly on my writing. And recently I realized that I’ve still been a passenger, hoping the winds of chance would blow in my favour. Not the best approach. Far from it. If I’m serious about achieving my writing goals, I need to move out of the passenger seat and into the driver’s seat. Sitting down and doing the necessary work is a big part of that. It’s not just about writing. As an indie author today, it’s also about tackling the aspects of the writing life that don’t come naturally to me, like marketing and social media engagement. The biggest challenge is having the right mindset: Acting like a successful writer. I’m still battling my inner critic. Still doubting my talent some days. Still battling Resistance. To live the life I imagined, I can’t sit back and wish, hope, or cross my fingers that what I want will magically manifest. I’ll keep writing, publishing, reading and honing my skills. I may fail, but I’ll keep it in perspective. I am determined. Determined to drive my creative journey. It’s time to do the work. Where are you on your creative journey? Do you see yourself as a passenger or the driver? Hit Reply or let me know in the comments section below. I’d love to hear from you. If there is one thing in this life that we must do, it is this: Do What You Love! Do What You Love is not just a trite adage. When used as a powerful guiding principle, it can transform your life. I know. I spent a good chunk of my adult life running away from what I love, from who I am. I did what I was ‘supposed’ to do. I went to university, earned a degree and then found a job. I didn’t exactly work in my field of study, which was French Literature. But living in Ottawa, the nation’s capital, being bilingual made the search for decent work easier. I worked in what was, for me, the grizzly world of nine to five. Policy Analyst. Executive Assistant. Proofreader. Program Coordinator. Project Administrator (Consultant). No matter how fancy the title or good the pay, boredom quickly set in. I never adjusted well (and I don’t think I have yet) to doing the same tasks over and over again, in a tiny cubicle, with the same people. It didn’t inspire. Maybe, too, I didn’t subscribe to the idea of the Canadian dream — owning a nice house, having lots of money, fame and recognition. I believed, and still do, that we should hard work, be determined and live a happy and fulfilled life. So, whenever the nine-to-five world became too ‘restrictive,’ I saw a simple cure: Change jobs. I did. Frequently. But it was never long before the excitement of the new job and work environment waned. Then I’d reach the point of loathing the work and taking regular ‘mental health’ days. A story of love, loss and obsession that will leave you wondering if there’s such a thing as second chances. Available on Amazon. The problem was simple. When it came to Do What You Love, I was failing miserably. Well, I was and I wasn’t. I’m a writer. It’s what drives me, gives me a reason to get out of bed. I’m always excited to begin each day by setting pen to the page as I write my Morning Pages. I really can’t remember a time when I wasn’t writing. But for a long time, I let myself be shamed out of writing. People — family, friends, colleagues — told me I’d never make it as a writer. That all artists were drug and/or alcohol addicts. Have it as a hobby on the side. Get a real job. When I kept writing on the side and got a ‘real job,’ I was mis-er-able. 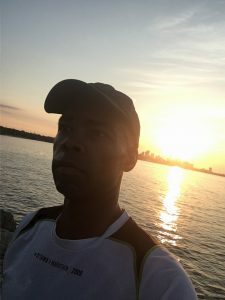 Looking back at the three most difficult times in my life — when I was actually clinically depressed and on medication — I was barely writing. I was doubting my work, doubting my talent, doubting my dreams. I’d lost sight of what mattered … and that had to change. In 2003, I stopped being ashamed of my writing dreams. I started to submit my work, and it was published. I made time for writing — before my soporific day job, during my lunch hour and before bed. Jobs came and went, but my writing held steady. That was when I noticed the shift. Making my writing a priority, I wasn’t miserable. The good days were like being on the open water when it’s smooth sailing, the winds are calm, and your destination is clearly in your sights. And on the bad days — when the tempest roared, and it felt like I had to fight for my very survival — writing took the pain away. I still have a day job, but it’s not nine to five. Do I love what I do as much as writing? Absolutely not. But I’ve found a way to ‘love’ it because it lets me do what I love. Write. If I’d been in any other job over the past five and a half years, it would have taken a lot longer to have my books published. Maybe you want to be the mayor of your city, found a non-profit that focuses on creativity for adolescents with mental health issues, open your own B&B… Whatever your dream, doing it takes courage. Taking that first step in the direction of your dream — despite the odds or what others say — gives you hope. Hope for today. Hope for tomorrow. 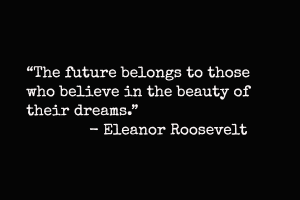 Hope for the life you’ve always dreamed of living. Let’s make the choice to walk through life with our eyes wide open, with our hearts tuned to what makes them tick. Are you doing what you love? Click Reply and let me know. I’d love to hear from you! I’d be lying if I said I wasn’t scared. Actually, I’m terrified. 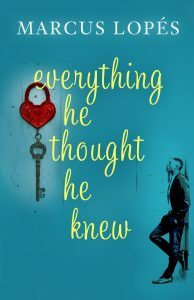 That’s because in four days my next book, Everything He Thought He Knew, will be released on Amazon. While it’s available for pre-order now, it’s not technically out in the world for public consumption. I’ve been here before — the waiting, the anticipation, the anxiousness. Will readers like it? Hate it? What kind of reviews will it get? Those are things, I know, that are out of my control. I have to stay focused. Then why am I scared? Because I must keep going. The publication of this novel is part of a larger dream. Chasing down that dream means I need to keep writing, get to work on the next book. I must stay focused. As 10 October (the launch date for Everything He Thought He Knew) nears, it’s been harder to stay focused. It’s not an unusual feeling. It happens every time I finish a big project. No matter how hard I try to move forward, I feel like I’m spinning. I look at the writing projects piled on my desk and don’t know how to begin. I write my to-do list and prioritize what’s most important. Yet at the end of the day I only check off one or two items. And not necessarily the important ones! I just can’t seem to sit still long enough to get anything substantial done. Feeling stuck, like I’m spinning out of control, can be disastrous if I surrender to it … let it have dominion. It’s the precursor to procrastination. And even worse, Resistance. To beat back Resistance, I must go back to basics. 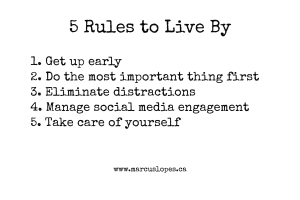 For me, that means holding strong to my “5 Rules to Live By.” It means — and sometimes I forget this — that I must do my most important creative work first. And when I show up to work, even if I only write a couple of hundred words or edit a few pages, I remind myself that that’s progress. One more time, I’ve shown Resistance the door. I haven’t surrendered. Sunday morning run on 7 October 2018. Stopped at the midway point of a 13k run to capture the view of Toronto. I am forever learning the art of work and play. Life is rich with all its beauty and with so many things to discover. Writing is very important to me, to my life, and each day I write I’m inching closer to realizing my dreams. But when I can’t focus, I know that it’s life speaking to me. And the message is this: take a break. Life isn’t, and shouldn’t be, all about writing. So, yesterday I decided to ‘take a day off.’ I binge-watched Deep State, starring Mark Strong. Loved it! But there was still a part of me that felt guilty, that inner voice that chastised me for not working. But I know that doing nothing did me good. It stops me from always looking to the future and where I want to be. It grounds me in the present, in the now. Taking time to rest lets my body and mind recharge. It allows me to come back and tackle my writing projects with a new vigour and see their worth (or lack thereof) from a new perspective. I’m slowly starting to gain traction. I’m settling back into a routine. Most importantly, I’m letting myself be a beginner again. Not every day is going to be perfect. Sometimes it’s going to feel like I’m writing uphill. There will be times when the writing feels stale and rigid, but I remind myself that it’s only a draft … nothing that can’t be fixed. Other days, still, will remind me of a bad run: I’ll cramp up, have to slow it down and rest, but I’ll keep going. Stay focused. It’s the best way I’ve learned to weather the storm. And then something magical happens: I finish something. That offers reassurance, when doubt lingers large and heavy, that I am on the right path. I am not necessarily at the beginning or the end, but somewhere in between. That is the artist in me holding steadfast to my dreams. The road is often long, filled with sharp, unexpected turns that almost send us tumbling. Some days we struggle to climb the mountain and its treacherous terrain. Other days we soar, feeling like nothing and no one can stop us — that anything and everything is possible. I like those days the best! Yet no matter what we face, no matter how daunting it may seem … we, as artists, keep on keeping on. It’s an exciting time for me. I’m getting close to publishing my next novel, Everything He Thought He Knew. I now have an amazing cover (sneak peek to the right) thanks to Lieu Pham at Covertopia. The proof of the print edition arrived yesterday, and it looks great. The eBook edition is being formatted. It’s all coming together. Finally. When it comes to Everything He Thought He Knew, the road has definitely been long, hard and, at times, seemingly impossible. It’s not just, as it started out to be, a ‘revised edition’ of Freestyle Love (published in 2011 by Lazy Day Publishing). It turned out to be a top-to-bottom rewrite of the story, with the central premise still intact. I had done a substantial rewrite of the original manuscript (Freestyle Love) before having it edited by thEditors. I thought, in hindsight naively, that I had nailed it. Until I received the manuscript back from my editor. It wasn’t that it was a bad story or that the writing was mediocre. My editor did what he does best: he pointed out the problems with the character and plot development, story arc, structure, continuity, et. al. And he wasn’t wrong. And that sent me spinning and back to the drawing board. I got to work and hunkered down. What I thought would be a rather smooth and fast rewriting process took a lot longer than I had imagined. (According to my Master Projects List, I started working on this book 21 February 2017.) For a time, that had me down — wondering if I could actually get through the rewrite and publish the book. But the point is that — despite the challenges, the disappointments, the days I feel like I’ve lost my footing — I still show up to write. I resign from competition. I keep the end goal in sight and press on. That is, to me, the art of keeping on: with persistence and courage, doing the thing we are called to do and, every day, heeding that call. What goal(s) are you trying to achieve? Are you determined to keep on keeping on? Let me know in the comments section below. Sometimes in life there are things beyond your control. You have to learn to roll with the punches. And that’s not always easy. 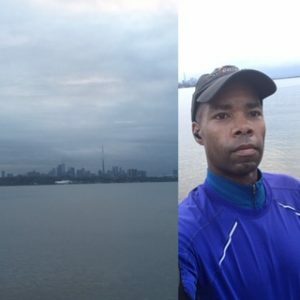 Out for an early run this morning (29 August 2018), and taking a moment to enjoy the fantastic view of Toronto. I know. I’m in a kind of precarious situation at the moment when it comes to my health. I’ve been in my doctor’s office three times since 6 August — first to discuss the symptoms that presented, then to follow up on each round of testing and decide the next course of action. There’s still no ‘clear’ indication of what’s happening or why. So, I wait. Wait for the next test, scheduled for next week, and then I’ll wait for those results. Waiting is the worst because, when I’m stuck inside my head, I imagine the worst of all scenarios. What if it’s this? What if it’s that? How will I react to whatever it is? Because maybe, after all is said and done, it’ll be nothing. Still, I want to know what I’m dealing with, no matter what it is. The first diagnosis and course of treatment seemed to ‘solve’ one issue, then unearth another. What I love about technology is how it’s made accessing my healthcare reports easier. Through the Patient Portal, I can see when my results come in and my doctor’s instructions, like File or Contact Patient. I made the mistake on the weekend of checking to see if the latest round of test results were in. They were, but my doctor was on vacation, so I didn’t know if there was an ‘urgency’ — like the last time — for us to discuss them. Returning from my doctor’s appointment yesterday, I know that it’s all beyond my control. Knowing that doesn’t stop me from brooding over what’s happening. I try to stay focused, but I know my productivity has taken a hit. Despite everything that’s happening, I’m trying to roll with the punches … take it all day by day. Yes, now is the time, if you haven’t already, to strike out. Don’t wait until tomorrow to start training for that half-marathon. Don’t wait until you retire to write the book you’ve always felt was within you. Don’t wait until the beginning of the month to start that diet you’ve been talking about since 2016. Whatever you want to do, whatever you feel you can do … begin it. Now. Let me give you an example of what can happen if you decide to wait. My father worked hard to provide for his family. It wasn’t until I was an adult, living on my own, that I understood the cost of raising a family, of living in this world (and that money didn’t grow on trees). We weren’t rich, we weren’t poor, but we never wanted for anything. We had the opportunity to travel — not extensively or luxuriously — but enough to not feel sheltered or uncultured. My father loved to travel and play golf. As his retirement neared, he said that travelling and playing golf would fill his days. A year and a half into his retirement (he was fifty-five when he retired), he was diagnosed with stage 3 pancreatic cancer and given about six months to live. He fought, fought hard to live … to travel, play golf, and do what he loved. My father passed away at age fifty-eight, eighteen months after his diagnosis. Yes, strike out now … just because you can, and that can yield fantastic results. Let me give you an example. At the beginning of 2018, I didn’t make any resolutions. I haven’t done that for over a decade. On 1 January, I woke up sick — sore throat, nasal congestion, and upset stomach. The cold lasted for about two weeks. Tired, feeling crappy and unusually irritable, I decided on 17 January that I was done with alcohol. No more drinking (I didn’t drink much, anyway). No more cooking with alcohol. My goal was to quit cold turkey. And I’ve been sober for more than 223 days. Together with running and paying closer attention to what I eat, I’ve lost twenty pounds. My energy level is up. I’m sleeping better. But I didn’t wait for the beginning of the next week or month to go sober. I started that day, a Wednesday, and didn’t look back. Yes, I can’t stress it enough. Now is the time to begin. Do it. Now!